Home // Readers Klub // Marvel announces new wave of female-lead titles !! Marvel announces new wave of female-lead titles !! It’s a good day to be a comics fan, especially if you’re a woman. Big hitters Marvel and DC both chose Friday to make major announcements about their comic book lines. 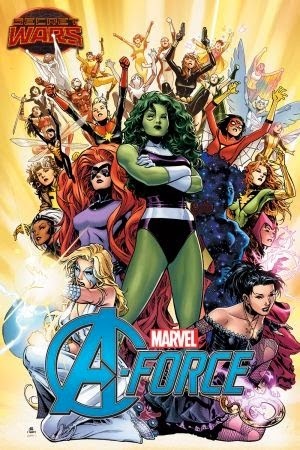 Marvel seemed to be edging ahead in the social media love-in after unveiling an all-female Avengers team. There was no sign of Captain America, Iron Man or Hulk, but instead a host of Marvel’s female heroes in a team to be introduced as part of its cross-title Secret Wars event in May. Storm, of the X-Men, and veteran avenger: the Wasp. Also featured are Captain Marvel, Black Widow, Spider-Woman and Moondragon – who, despite this new age of female empowerment at Marvel comics, doesn’t appear to have lost her revealing green costume. Hello to every one, the contents present at this web site are actually amazing for people knowledge, well, keep up the good work fellows. know such designated approximately my trouble. You are wonderful! Stay up the good work! You know, many persons are looking around for this information, you can help them greatly.